Step out of the ordinary and into the extraordinary with a trip through the streets of Albuquerque in a new Mitsubishi Eclipse. This popular compact SUV packs an impressive amount of technology features into its small size. This innovation in automotive technology is designed to impress even the savviest driver. 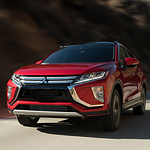 The patented MITSUBISHI CONNECT groups a host of useful services together so that you feel safe and secure in any road condition. Included in this service are emergency assistance on the road, remote start and climate control capabilities, and more. Because this is all controlled through a smartphone app, you can be assured that you will remain connected wherever the road of life may take you. The heads-up display allows you to keep your eyes safely on the road in front of you. Projected onto the windshield directly in your view is a host of data indicators such as speed.